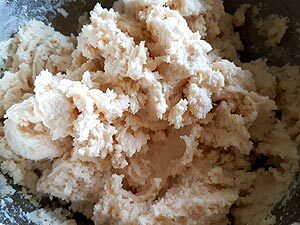 Today I’m going to share my tried and tested recipe for ricotta cheese cookies which is also famously known as Italian ricotta cookies. 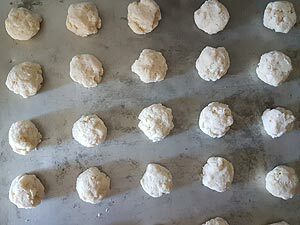 How To Make Ricotta Cheese Cookies? A few days back I had bought 2 containers of ricotta cheese to make an Indian sweet as mentioned in my vegan carrot cake recipe blog post. I couldn’t get to it though and later I didn’t have to make it anymore. The occasion had passed. So I started looking for ricotta cheese baking recipes because it worked out well with these chocolate ricotta muffins and breakfast cookie recipe. 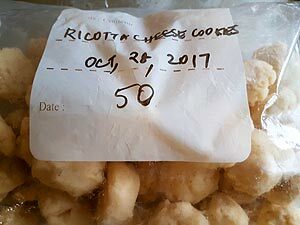 A couple of ricotta cheese cookie recipes showed up and I used this recipe as a base to make my version of the best ricotta cookies without eggs. 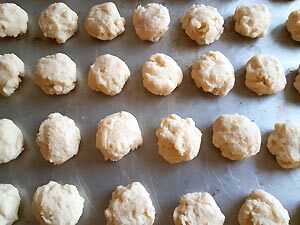 As always with my eggless cookies recipes, I used Ener-G egg replacer as an egg substitute to make these easy ricotta cookies. 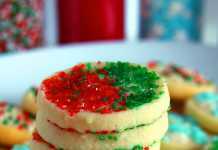 If you want to make a big batch of cookies for any special event or gathering, keep this recipe bookmarked because it churns out a ton of cookies! Also, these ricotta cookies are very soft and tender. So it actually feels like eating small pieces of cake. Another plus is we can frost these cookies and decorate it for any theme/festival/holidays. I used one half of the recipe to make Christmas cookies and another half for a friend’s baby shower who was expecting a girl. Easter, Halloween, Thanksgiving, you name it and all you need is the respective colors of icing and sprinkles. 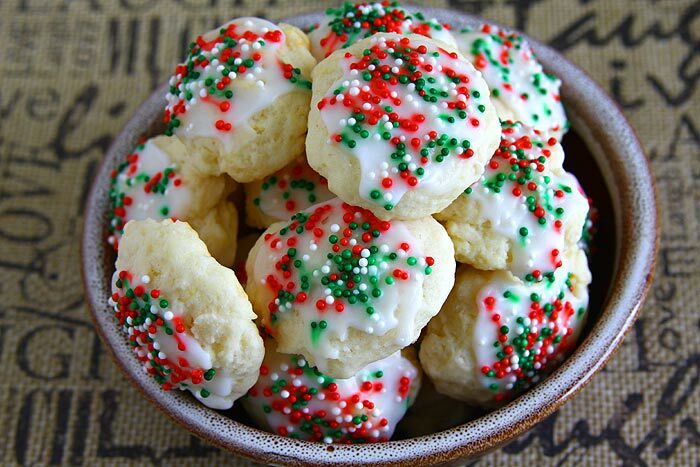 Ricotta Cheese Cookies Freshly Baked. 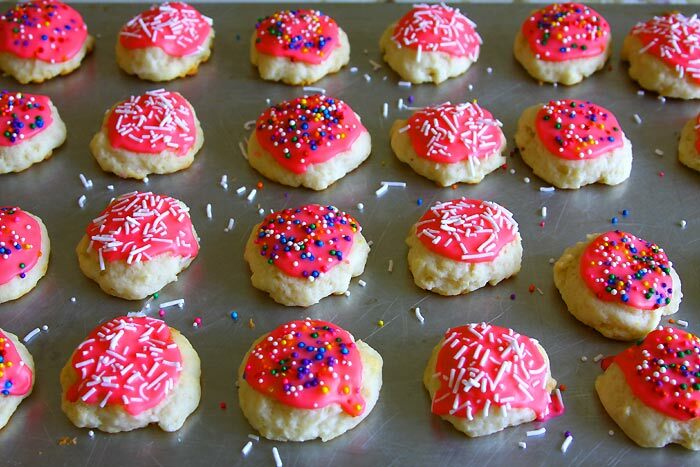 Bake these tender, cake-like Italian ricotta cheese cookies without eggs and decorate it with your choice of icing and sprinkles and make any event a special event. Preheat oven to 350F/180C. Lightly grease cookie sheet/s with non-stick cooking spray or use the butter wrapper. 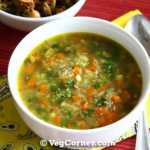 In a large bowl sift together the dry ingredients mentioned in Part 2 and set aside. 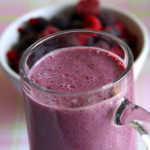 In a small cup whisk together the EnerG egg replacer and water and keep it ready. 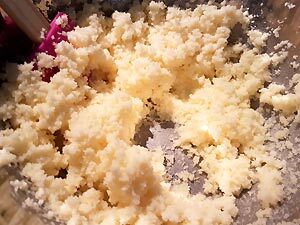 In another large bowl beat together the butter and sugar until light and fluffy. 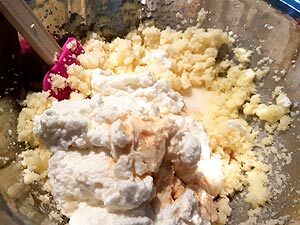 Add ricotta, vanilla, and the egg replacer mixture and beat on medium speed until combined. Scrape down the bowl. 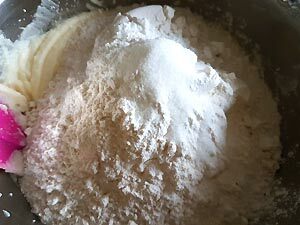 Add the flour mixture to the creamed mixture and combine well. 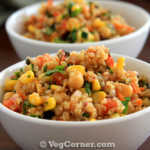 Using a tablespoon, scoop out the dough and drop it onto the prepared baking sheets, 2-3 cms apart. Lightly flatten the dough. 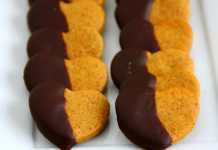 These cookies don’t spread very much so little gap should be fine. Bake in preheated oven until cookies are very lightly golden, about 13-16 minutes. The cookies stay white, so it is not easy to judge if it is fully done or not. I test baked 3 cookies for 14 minutes and felt it needed more time and so baked the rest of the cookies for 16 minutes. Transfer the baking sheet to a wire cooling rack for it to cool down. 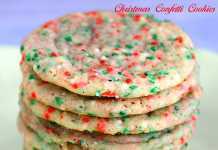 After a while using a spatula remove the cookies from the sheet and place it back on the rack to cool completely before storing it in airtight container or frosting. In a small bowl, whisk together the powdered sugar and milk until smooth. Keep adding the milk in very small increments because the icing tends to get watery very quickly. Such type of icing will be runny and will not stay on the cookies and will keep oozing. 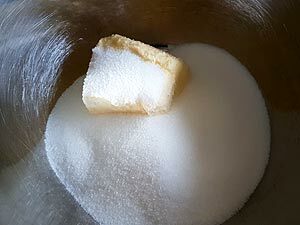 So if the mixture is too thin, add more sugar and add milk if it’s too thick. If you want to add color to your icing mix you can add in that too. Once the cookies are cool enough and the icing is ready, spread little icing over each cookie, then top with sprinkles while the icing is still wet. 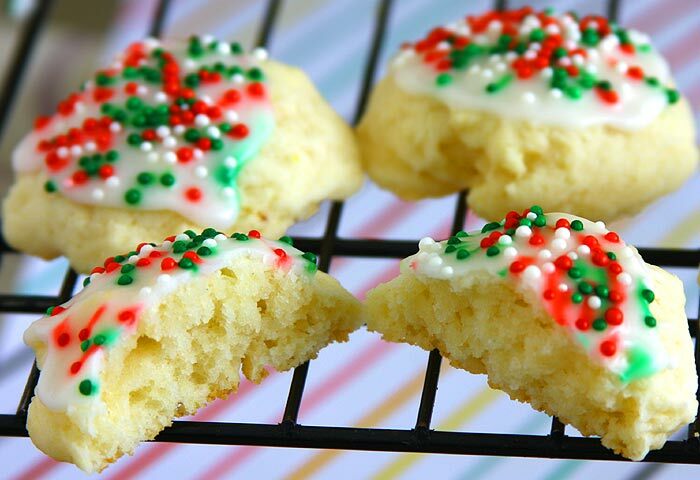 Allow the icing to dry completely before storing cookies in an airtight container. 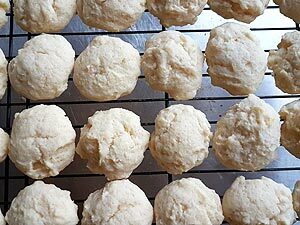 As I have mentioned in the post, this ricotta cheese cookie recipe makes a huge batch. So I did not bake all of it right away. I just baked half the cookies initially. The rest of the dough, I scooped the dough and placed it on the cookie sheet and put it in the freezer for about 30 minutes. It had nicely firmed up. Then stored those cookies in a ziplock bag and put it back in the freezer again. About 2 weeks later I had to go to a baby shower. 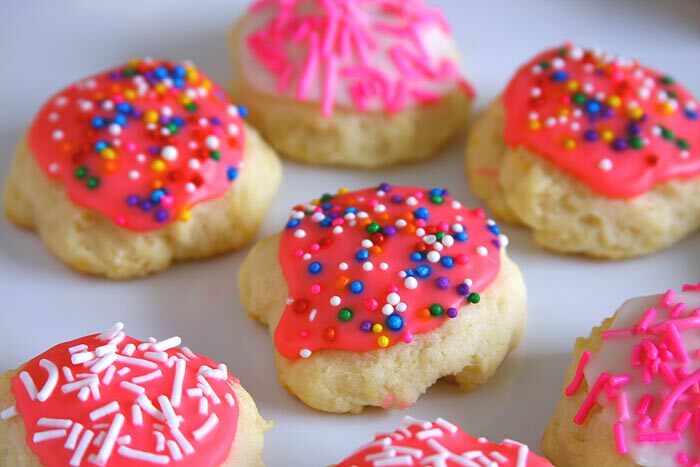 So baked these cookies and used a pink color icing and decorated with pink and white sprinkles. You don’t have to thaw the cookies before baking. Just removed the frozen unbaked cookies from the freezer, place it on the baking sheet and bake it for additional 2-3 minutes probably. Or as always test bake 2-3 cookies initially, see how it turns out and decide accordingly. 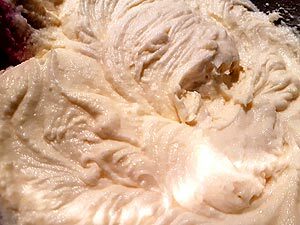 You can try cutting back the recipe by half if you don’t want to bake a huge batch but my suggestion will be to make the dough and freeze it for later. 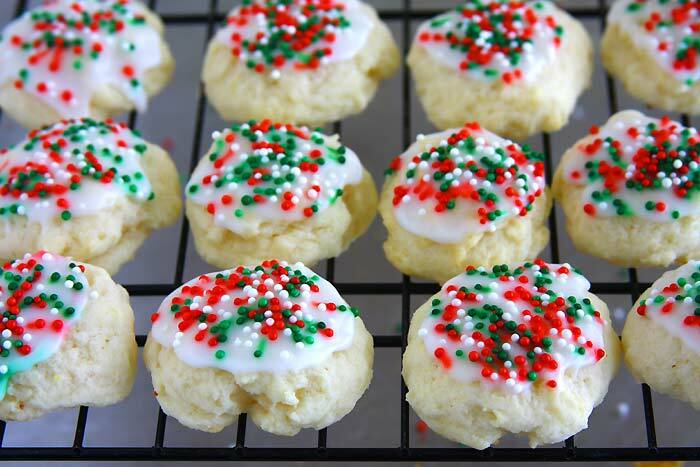 I bet you will regret not making an extra batch of these soft ricotta cheese cookies once you taste it. * Nutrition Information for 2 cookies, without frosting and sprinkles. 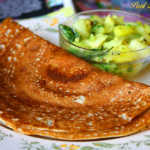 Looks very yummy and easy to make too..Any other option for ener-g replacer..